„Confidence is good, control is even better“ – we use numerous internal and independent controlling instances for the safeguarding of your assets. For us, compliance is not a duty, it is something natural. Quality is a constant factor for us – we control permanently. We are committed to provide maximum safety of your data and access to your investment portfolio and account. We protect your data with state-of-the-art safety technology. All personal information is constantly encoded and stored at a computer center in Germany. 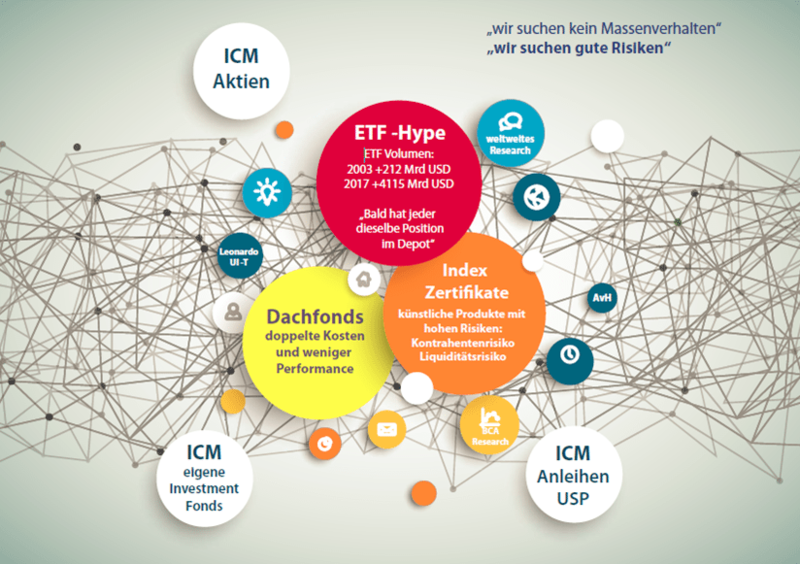 As a financial services institution, the ICM InvestmentBank AGthe company is a member of the Securities Trading Companies Compensation Fund (the German EdW). The financial crisis of 2007 has considerably damaged the trust held by investors in bank and asset managers. The strict regulations by global financial auditors following the crisis were able to at least restrict the damages. The account and portfolio are exclusively managed in collaboration with prestigious custodian banks This way the highest possible standards are offered to our Customers, while a second, independent auditing authority is involved. With us, each investment decision is subject to the four eyes principle, which means: Our portfolio managers always decide as a team on the financial securities that will be adopted in our investment universe. Risky „Solo runs“ are so excluded. We have equity capital available for the amount of approx. EUR 3.5 million. We also belong to the Securities Trading Companies Compensation Fund (the German EdW). OUR QUALITY MANAGEMENT IS ONE OF THE BEST. Independent Investment Committees for shares, bonds, ETFs as well as a series of own-managed funds are at the basis of your investment success. With tactical asset allocation and quality auditing management, asset classes portfolios are adequately balanced according to the market situation. We are always searching for „good risks“, namely, investments with a high value return at a minimum risk. All economic sectors are increasingly digitalized, which also applies to the financial branch. This builts a further new process domain within the ICM InvestmentBank AG. While currently many investors entrust robot advisors with their asset management, which are self-learning computer algorithms, the ICM InvestmentBank leverages digitalization for the enhancement and simplification of the customer processes. This includes the secure, digital exchange of personal data and specifications in order to accurately compare changes in offers and requirements. More updated and extensive information can be prepared via the automated information interfaces, at any time via any medium. We do not understand by digitalization that we should entrust self-learning computers with your money, as they only start learning about “running” after a 2-year development phase. High quality is for us the creation of tailor-made investment strategies based on the fundamentals of natural intelligence.